The Journal of Organometallic Chemistry targets original papers dealing with theoretical aspects, structural chemistry, synthesis, physical and chemical properties (including reaction mechanisms), and practical applications of organometallic compounds. Organometallic compounds are defined as compounds that contain metal - carbon bonds. The term metal includes all alkali and alkaline earth metals, all transition metals and the lanthanides and actinides in the Periodic Table. Metalloids including the elements in Group 13 and the heavier members of the Groups 14 - 16 are also included. The term chemistry includes syntheses, characterizations and reaction chemistry of all such compounds. Research reports based on use of organometallic complexes in bioorganometallic chemistry, medicine, material sciences, homogeneous catalysis and energy conversion are also welcome. 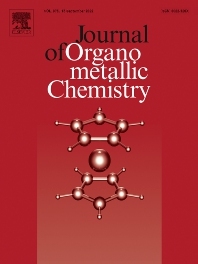 The scope of the journal has been enlarged to encompass important research on organometallic complexes in bioorganometallic chemistry and material sciences, and of heavier main group elements in organometallic chemistry. The journal also publishes review articles, short communications and notes.